A solar-powered family car completed its drive from Los Angeles to San Francisco fueled by good vibes and pure California sunshine. And after turning the heads of gobsmacked onlookers during its journey up California's scenic Pacific Coast Highway, the creators of "Stella" are dreaming of a day when their futuristic vehicle is a commonplace sight. The lightweight, wedge-shaped automobile is capable of traveling 500 miles (800km) on a single charge—further if the sun is shining—while clocking 80 miles per hour. 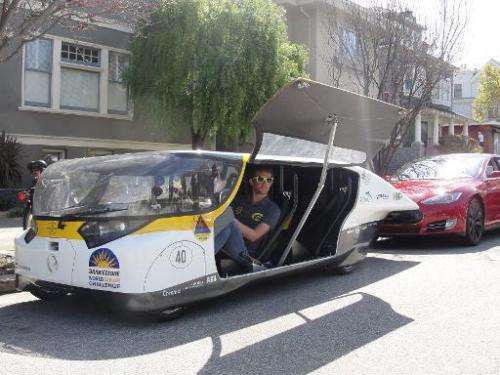 "It was great to see all the people looking at us; hurrying to get their smartphones out to get pictures while we were driving," said Lex Hoefsloot, manager of Solar Team Eindhoven. "I think we caused some traffic jams and we were worried some drivers might run into us while trying to take pictures." 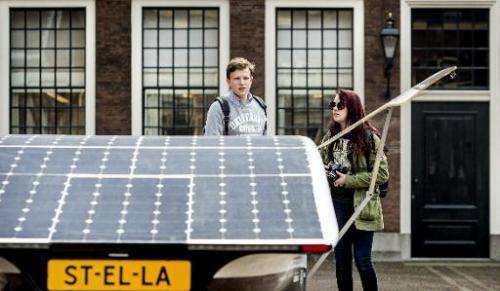 Hoefsloot is one of the students at Eindhoven University of Technology in Holland who designed and built Stella in what grew into a school-wide project that won a World Solar Car challenge race across Australia in 2013. Stella launched a US tour in Detroit at the Intelligent Transportation Society World Congress in early September. The team drove to San Francisco to join sponsor NXP Semiconductors of The Netherlands in an event focused on a future in which roads are made safer and air pollution reduced by cars that "talk" to one another as well as traffic signals. 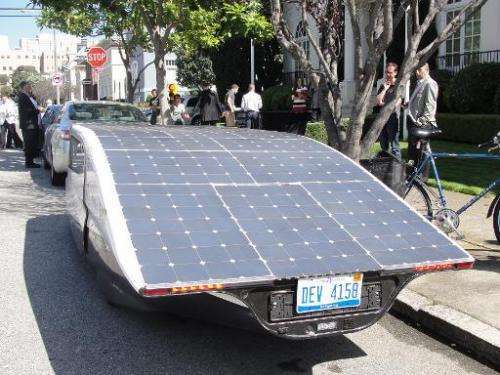 The street-legal four-seater pulled up to the Dutch consulate residence in San Francisco and eased in front of a red Tesla that was equipped to swap information with the solar-powered cousin. Inside the car, a tablet computer on the dashboard showed a traffic light and counted down the time until a signal ahead would next turn green. A transmitter in the Tesla let Stella know where it was and what it was doing. "We think it is possible to make these cars and have them in a showroom in five to 10 years, but it is a big dream and something we have to really work on," said Hoefsloot. The technology in Stella is not new and if the solar cars were mass-produced like gas-guzzling models they could be similarly affordable, according to the student. Big auto-makers have had little contact with the team because "they think it is too far-fetched," Hoefsloot told AFP. "We think otherwise, of course," he said as he leaned on Stella's low, dark roof. "It is the first family car that is powered by solar energy, it just doesn't have a family yet." Car components colossus Delphi has already been enlisted by General Motors to make auto-to-auto communication modules for future models. "As more cars have it and people get excited by what it does, then you get safety benefits and it starts to snowball," said NXP marketing senior vice president Drue Freeman. "It is time to get the fly wheel spinning." NXP makes chips for Delphi modules tailored for cars to trade information such as proximity or directions of approach. Ability of vehicles to get real-time data from one another and traffic infrastructure is seen as key to a future with self-driving cars such as those being worked on by Internet titan Google. Intelligent cars that "talk" to one another and to traffic signals will reduce accidents, congestion, and pollution, advocates maintain. "When we first started talking about connectivity, people said it was infotainment," Delphi vice president Andrew Brown said during a panel discussion at the Dutch consulate. "Now we are seeing the evolution to safe, green, and connected." The auto industry and regulators will need to work out standards and practices regarding how car-to-car communication systems are protected from hackers and who has rights to data gathered. "A car could be like a smartphone with wheels when it comes to knowing who you are," said Secunet management board member Willem Bulthuis, who was on the panel. "If I am in an accident, can the police get information out of my car to prove I did something wrong? Can I get access to prove I didn't do anything wrong? That is the discussion starting now." Among the questions is when, or should, car owners be able to "erase the brains" of their vehicles, essentially wiping away memories. How is mass flow rate a force? Do petroleum engineers struggle with ethical dilemmas? What's happening to Boeing's production?